This winter, I had an opportunity to participate in an information research team that had a chance to interview top executives in health care in Massachusetts. This included the CEOs of insurance companies, regulators from the Attorney General’s office, and medical directors of major medical networks and hospitals. The goal of this project was to understand one term “Cost Containment” — what are the drivers for rising health care costs and what can be done to slow the rate of growth. When someone with taxonomy skills participates in these types of investigations, it is hard not to put those taxonomy skills to work. What did I learn from this process that might be applicable to best practice and to understanding health care cost containment? This group started with the question “What is cost containment?” It is a fairly fundamental question since we in Massachusetts are fortunate to have universal coverage (about 97%) but there is a need to control costs. By asking this fundamental question. the group could collect basic facts from each key player on the same topic to understand how proposed strategies are defined from the point of view of key players who are shaping policy. The above list is a top level of the Actors/Player facet which further breakdowns. Insurers for example is further categorized into companies, corporate structure (profit/non-profit), market share. Not all the groups under these broad headings share characteristics. For examples, we rarely saw a “specialist” at a meeting on cost containment, but other types of medical personnel including primary care, psychiatrists, behavior medicine, were well represented because they, as a group, lower reimbursement and higher volume than specialists. Grouping does not mean all values are inherited — thus the need for understanding power relationships and attributes. Some actors have more power and are core to the discussion. Insurers and providers have a closer affinity for example, while consumers, including employees, business and local government entities tend to have less to no power in these relationships. Hospitals and specialists have more power than primary care and behavioral medicine. Understanding these internecine wars within health care is a key analysis for understanding core relationships and who is outlying. The health care debate is in part about how to give outliers more power and equity in the health care process. The most outlying of all voices is patients and consumers. Theoretically, in new models of health care, their voice is supposed to be represented by larger purchasing pools who can negotiate for better service at less cost. Each of these attributes needed to be further understood from perspective of the key players to understand how it contributes to cost. For example, Massachusetts has an excellent universal health care law, where consumers can choose from about 18 different plans over the Connector, but in addition, there are additional public, private and individual plans resulting in over 16,000 different plans. Some cost containment could be achieved by having a “shared minimal contract” that is at a high standard of care, and captures essence of basic wellness. To do this, the players and consumers need to find the common language for describing conditions and coverage. 5) Capture the AS IS Definitions. Since these conditions and coverage are not standardized, it is useful to understand what the current status is. Understanding AS IS definitions help to capture the many disconnects between group. For example, while consumers argue about cost of deductibles, insurance companies might spend more money in order to reduce high cost of hospitalization. Result is like a balloon filled with water — one end gets leaner, while more pressure is put on another end of the balloon — the consumer. Capturing the cacophony, instead of the symphony, turned out to be the most valuable part of the work. We discovered we did not have to reach common understanding, which meant trying to capture the current status and its impacts. In addition to understand the “cast and drivers” it is also important to read studies and literature to keep a broad and balance perspective. Being in rooms with charming and knowledgeable power players can be quite intoxicating, but to keep it honest, we needed to keep reading and we needed to ask honest questions about what was the advantage for each player in their advocacy for a certain program. Spending a few hours each week on literature reviews, books, articles, podcasts on general health care was very important to building our group and individual knowledge base and developing our facility in the terminology of health care economics. We used reading to define comparative health care models in other countries (Taiwan, Switzerland, Japan, Canada, Germany, UK, France, and US) and to understand multiple models of healthcare delivery. Even within our small, random data collection group, there were divisions in understanding can be quite diverse. Using simple diagrams to capture concepts turned out to be powerful shared way to come to common understanding. Bubble mapping, graphing, hierarchical diagrams, any visual graph was useful to clarify information. “Cost containment” is not trivial, but it is also important to understand. And it is almost impossible to explain without learning something about healthcare system. It is worthy of the time and effort to create a taxonomy to define the information space or information void, and a void is filled by misunderstanding or misinformation. Developing a consumer-focussed taxonomy for navigating health care turns out to be valuable work, but it is hard to sustain without a dedicated team with and sustained funding. A consumer-focused taxonomy would help navigate the health care debate, can be used across all actors, including insurers, providers, governmental entities and consumers who want to share information with a confused but curious public. The open source community at Drupal is quickly catching up on how to use its taxonomy module. The latest code module creates a Taxonomy Accordion— aka faceted navigation. 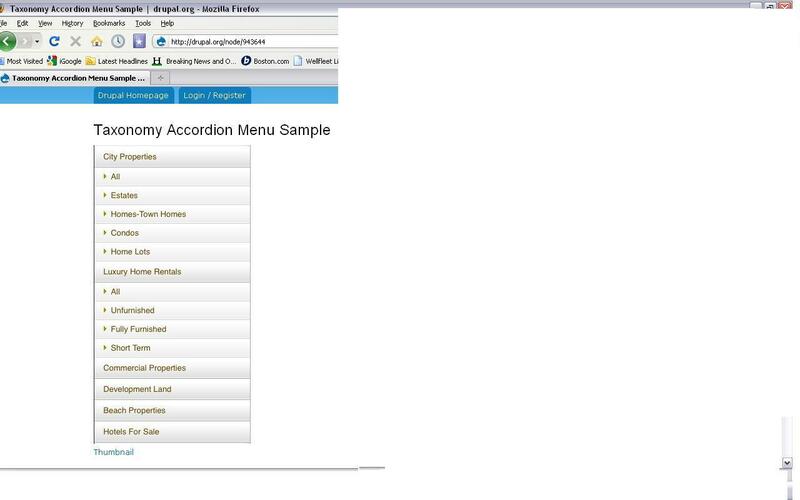 What Taxonomy Accordion shares with faceted navigation is good. A taxonomy accordion lets a user know at a glance what a website is about, and how to find information, and also what won’t be found. Pay attention user-centered design and validation: The fundamental choices of categories has to make sense to users. Even if you make up an initial set of categories, use a validation process to ensure that the taxonomy makes sense to users. Validation is a two-step process. Part one is an open process, sometimes called an open card sort, where terms are collected from users, content, and sources, and then organized into a draft of the taxonomy. The second part of the process is closed, users are asked to find content using the navigation scheme to test whether the classes and hierarchy are useful or need to be refined. More importantly, by using a validation process and making it part of the plan, you become more user aware and attentive to user needs. Use this opportunity to improve tagging and metadata management: Content has to be tagged with terms from the taxonomy so you need a back-end business process and metadata eg database design to store the tags and pointers to associated content. This backend metadata record can also help in creating an optimized your search engine especially an engine that supports faceted search such as SOLR. Understand restrictions and attributes: Some facets are not larger super-classes, but are attributes (sometimes also called “slot facets” or “datatype properties”) that are used to restrict or narrow search. These restrictions in an ecommerce application might be facets size as “Measurement, Color, Availability.” In a content or digital asset application, the restrictions might be “Content Type, Publication Date, Format.” By grouping these terms, it helps to reduce permutations and complexity in interface design and in writing queries. Foster distributed environments and local control: This is hard to understand, but the faceted design is not authoritarian. If the faceted design is based on user needs and a validation process, than it is likely to reflect shared values. It still allows local organizations to develop and manage their information; it makes it easier to map that information to process and workflow. For example, a music company might have all its artists map their music to shared facets such as genre. A local social service agency might be asked to map its services to a common public service metadata scheme. Allowing local agencies to update their metadata, tag content, and suggest terms for taxonomy is a great way to identify user needs and changing requirements. Change and Improve: Once categories are established, a change management process needs to be in place to monitor user queries to make sure that the categories and terms remain current and useful. Setting baseline thresholds — vital statistics — (to be discussed in next month’s post) — can help in recognizing changing markets, technologies or user needs. An open source faceted navigation should allow implementation at a lower cost. Even with an Open Source solution like Drupal, which offers flexible options, it pays to invest some attention to understanding taxonomy business process because it will lead to more efficient implementation and efficient backend process. The Return of Investment (ROI) justification include not only user interface improvements (reduced clicks to right content) but also programming cost efficiencies such as more simplicity in writing backend queries – great ROI justifications for the work. Validation work segues with the work of marketing and customer relations, so consider integrating taxonomy validation and governance into existing work processes. Some organizations roll taxonomy management into a knowledge management function which oversees the entire process from organizing knowledge categories, managing content acquisition, and monitor. Drupal’s development community has some very sophisticated features that will be available in the upcoming years including ways to visualize and cluster linked data, using RDFa. Developing faceted navigation and taxonomies is a great way to get ready for an exciting future of visually interesting interfaces that better help users find and share information in complex organizations. Don’t let the simplicity of the Taxonomy Accordion fool you. Use the accordion as an opportunity to understand user needs, how users look for information, and making underlying production, tagging and databases more efficient and focused on user needs and high quality information. At SemTech in June 2010, several speakers including Professor Deb McGuiness drew a very clear line was drawn between what a taxonomist does and what an ontologist does. Taxonomists build hierarchies, and ontologists determine classes or categories. In other words, ontologies are neat and unambiguous, and taxonomies are a bit messy. Defining classes or ontology work typically precedes building the taxonomy. Defining the classes is like writing a specification for the taxonomy; in fact defining classes is the same as defining facets. The goal of a taxonomist and ontologies should be to define a specific, unambiguous description of a term that helps manage how we find and organize content so the pathways are clear and specific; adding an ontology ensures that the term is placed in the most specific categories to help ensure clarity and lack of ambiguity. I would argue that no taxonomy is useful unless it is faceted – that is, has been divided into classes. Taxonomies work best when they share homogenous properties, and when they are smaller and focused. 1) Clarify specific terms by situation or functions: If I am interested in Java as a programming language, I want to see material related to Java as software, not as slang for coffee or an island in the South Pacific. If I am looking for “drill bits,” it might be important to understand if the drill bits are for my home electric screwdriver or for an oil rig. Classes capture these distinctions, and help to create precise specific tagging and information retrieval. 2) Ease longterm maintenance issues: Christine Connors points to a simple but common example where taxonomies are built where people’s names are included as narrow terms under the role such as “Hillary Clinton” is “Secretary of State” or “Charles Windsor” is the “Prince of Wales.” The problem is that when people filling these roles change, there is a maintenance headache. A classy taxonomy recognizes that there is a separate class for <people> as an entity, as distinguished from <role>. <People> and <Role> can be connected by a predicate such as <isA>. These distinctions are necessary for fast-changing information (such as who is dating whom in an entertainment application) or (who owns whom in a business application). 3) Facilitate sharing and importing taxonomies: Having taxonomies that are specified by a class description means the taxonomy will be more homogenous, have shared properties, and be more focused. This will make it easier to import with less cleanup and review. It will facilitate the use of SKOS for example. Messy taxonomies are harder to merge. To keep these categories clear and distinct, ontologists rely on building a conceptual model or a picture of the domain (see earlier post on Taxonomies and modeling.) Modeling strategies involve skills of most taxonomists. Most taxonomists have been taught how to capture vocabulary and how to identify facets. Check out the blog post Taxonomies and Modelling for more information. Elaine Kendall of Sandpiper Software, which is a concept-modelling tool. suggested that “one could build an ontology in 2 hours.” With new generation of tools that can create RDF/OWL from data and content, this statement might be true. With good modelling tools that automatically generate RDF/OWL,such as TopQuadrant, taxonomists might be able to slide into the needed role as ontologists. Taxonomists need to understand some basic concepts in RDF/OWL to extend their skills such as what is a class, what is a property and what is a slot facet, what is class inheritance, what is meant by reciprocation and inverse properties and how to write a SPARQL query. But more importantly, a classy taxonomist can help become a facilitator to help build bridges between user and development communities and to help diagnose and prevent technical problems. Develop processes to keep vocabularies current, and understand how to use metrics to “measure and improve” any vocabularies. To be part of the development team to help identify if a source vocabulary might be part of false inference. The taxonomist works with different user communities as well as developers and helps bridge the gap between what users and experts know and what is needed to build a useful application. A classy taxonomist has a well-rounded set of skills that can work with development teams and user organizations to build intelligent systems. Taxonomies are collections of facets that consist of terms that are described and made unique through connections to each other through relationships. The common relationships are equivalency, hierarchies, and associative (related) relationships. Of these relationships, the least understood of these relationships and the least used is the associative relationship. Associative relationships are sometimes also called related terms are sometimes also called See Also relationships or sydetic (cross-references) structures. One of the reasons that associative (related terms) are least used is because of the confusion about how they are implemented. Hierarchies move us up and down a category of information that share common properties. Associative relationship help point us to other aspects of a topic. Associative relationships can help sort topics into clear categories. This creates more simplicity that helps both programmers and users. For example, might be about paper products. If I organize one giant enterprise taxonomy with a single hierarchy, types of paper products from envelopes to toilet paper will be mashed in with other topics such as paper weight, composition, manufacturers, or activities for which product is used. The associative relationship can be used to connect the dots between the columns in the table above . An associative relationship can be displayed as a See Also, a Related term (RT) as in ANSI-Standard Thesaurus relationships, or as a semantic relationship (predicate) as in a semantic triple. Processing Improvement: Each facet is mutually exclusive/orthogonal and recombined as needed with other facets. Extensibility: Since the design is based on a model and add new facets such as content type (blogs, videos), audience or customer, events (such as weddings or business) or additional attributes such as color. Ease of Maintenance: It simplifies long-term maintenance because you no longer have to dive into and sort through or under complex hierarchies to find related concepts. The very best part of this approach is that you can change the taxonomy model , without changing the content, and you can update the taxonomy with new terms, such as processes, and it is updated everywhere. There is one important caveat in this approach. My data shows that this predefined modeling works 80% of the time but for about 9% of uses cases, you will run into glitches because of ambiguous or co-occuring single terms that might appear in multiple facets. These are words such a such as “treatment” or “process ” or “evaluation” which, as single terms, are somewhat vague. When combined in compound phrases, such as “Water-processing” or “Chemically-treated”, the meaning is clearer. In my practice, I typically identify and sort these vague guide or hub terms such as “process’, “treatment’ “’management”, “evaluation” and so forth and sort them into a separate facet. I can then use an associative relationship to point to the more specific compound terms (which are in their appropriate facet.) When these terms are then sorted into the right facet, the meaning becomes even clearer. This sorting of terms into facets and linking facets with relationships, including semantic, RDF-like, relationships as shown above can be used to create more specific information spaces. The string that results from this work is more precise than a term that stands alone with no associated relationships. By using associative relationships, you can build a taxonomy where it is easier to discover related facets of information, and to combine attributes to refine searchers. For example, if I am looking to information about envelopes for a wedding invitation, associative relationships might also help me find information about wedding planners, or wedding destinations. I can find videos on how to properly create an invitation. Associative relationships are the least understood, but when you take the time to learn how to create them, it becomes one of the best arguments for taking the time to build a faceted taxonomy and in adapting data modeling techniques as part of taxonomy development. If you are designing associative relationships for online systems, whether it is for managing content, e-commerce, or search, you might want to be attentive to how you create associative relationships because there are implications for implementation in improving user navigation and in machine-to-machine processing. NOTE: In future posts, I’ll put up a reference table to show the relationship between kinds of associative (related terms) and semantic labels for predicates in a “triple.” Look for that in future posts. My last post was an experiment in using remote online card sorting as a way to build a taxonomy. And why start small. My sample data was the picklist used on www.medicare.gov when you search on “What does Medicare Cover?” For my experiment, I used websort.net. as the remote card sorting tool. First, let’s start with the good news. Online tools are basically very cool way to bring together remote groups where it would be too expensive or politically impossible to connect. That’s the promise. Keep the test under 20 minutes: Online card sorting is a time-consuming task for the participant, so for the experiment to be successful, you need to make sure that participants have the time and that the number of terms to be sorted are not overwhelming. Joseph Busch of Taxonomy Strategies and Dave Cooksey, saturdave.com suggest 20 minutes/25 terms at most. My comprehensive test of all 132 picklist terms from the Medicare site was too big. Pretest the taxonomy: Since the card-sorting activity is a one-time opportunity to engage testers , some prior testing of the taxonomy should occur. Remote card sorting is better for closed experiment where a taxonomy has been designed, rather than an open card sort where the goal is to discover categories and facets. The best practice recommendation is to run some prior tests of the taxonomy before that online experiment. Have a trusted expert do the test, and then throw away obvious problems. If the pre-test doesn’t go well, try again. Testers in an online setting have a low tolerance for obvious problems, so the test needs to about validating a good design. Choose online tools carefully: The tool I used, websort.net, had a major problem. It only allowed a term to be classified under one and only category. This proved frustrating to users. For example, users wanted to classify durable medical equipment under the category for Equipment but also under the category for the Disease or Chronic Condition. Dave Cooksey, who tracks tools, says remote tools are improving all the time — so evaluate tools and choose wisely. Be sure to thank the participants: We all feel manipulated by many of the group activities we attend in the face-to-face world, and that can happen in the remote world as well. Being authentic and courteous is important. Provide a thank you and be sure to share results or feedback. If possible, consider some kind of compensation such as a gift card. Run tests prior to online activity. Have experts try the test. Remember the goal of a taxonomytest is to find the higher level categories that overlap between the technical expertise and general understanding. In the scheme of a trillion dollar problem like health care, a project to set up well-designed remote cards sorts that can compare how different user groups sort fundamental medicare concepts seems like a small investment. A well-run test with a good recruitment could be a very good way to jumpstart better designs of websites such as Medicare that deliver clearer information about benefits and choices. I am very interested in the health care reform debate, thus I wanted to know what a public option might look like. I was told by my sources that a robust public option might look a bit like Medicare. So off I went to the Medicare.gov website to find out what was covered. In the middle of the home page in the second column, there is a link to ‘Find Out What is Covered, ” which leads to an advanced search criteria page. The search page includes picklist of about 143 topics, just the right size for a sample set of candidate terms for a card sort. This month, I am offering a small interactive experiment in online card sorting. Taxonomies are collections of facets, which are created by organizing concepts into categories. Card sorting is one of the best ways to identify categories by having controlled tests with groups of users to create categories, that can be validated through repeated tests, until there a consensus. In health care reform, taxonomies might be useful to help create consumer-friendly interfaces to help search across the national insurance exchanges. Please feel free to assign terms to multiple categories or to suggest other categories. Last month, Joseph Busch blogged about the judicious use of online web sorting tools – that they may not be the most cost-effective way to build taxonomies. One of his arguments is that the sample set of users will not be random. That’s true. This blog has a small readership who have interest in taxonomies, and probably have a consumer’s interest in health care reform. Let me know what you think of websort.net. This little experiment could help demonstrate some bigger observations. Government may be looking to advanced high volumentechnologies such as clustering or semantic technologies to identify categories and to map claims data. Perhaps one of the applications will be to build interfaces that will help consumers search across the national exchanges. But at the core of these technologies, there will be a need for well-designed taxonomies to help analyze text and building better interfaces to access health care information. Let’s find out if taxonomy design can help us sort through health care reform. Thanks to Andy Oram and the Sunlight Foundation for introducing me to this tool and to Dave Cooksey who is virtually updating my card-sorting skills.